I probably won’t be posting many recipes as I don’t typically cook much. I have a wonderful husband who does most of the cooking. Mostly because I work too much, but also he does the cooking so I can do more important things — like SEW! But I just had to share this one with you because it is AMAZING!!!! I’m not sure where it came from. I just found it on our printer one day. I wish I could give credit to someone, but I can’t for the time being. And it is just too wonderful not to share. I made just half the recipe and it served 6 of us for desert. The little monkeys loved it. They asked for seconds. I love the fact that it is low in sugar. Obviously there is natural sugar in fruit, and the fruit juices have natural sugar. I made sure though that the fruit juices I bought didn’t have any added sugar in the list of ingredients. Also, I used granny smith apples because I like mine a little tart and like for the apple to hold up some when cooked. If you decide to make it, let me know what you thought about it. I thought I was in Heaven. In large heavy bottomed saucepan, over medium heat, combine vanilla, cinnamon, apple juice, orange juice, and cranberry juice. Bring to simmer and add apples. While apples are cooking combine all the ingredients for the topping in a medium mixing bowl. With a fork or your fingers, work the topping together to thoroughly combine. Add pecans and toss gently. Once apples are cooked, transfer to an over ready baking dish with slotted spoon. Return the liquid back to the medium high heat and cook a further 10-12 minutes to reduce the liquid into a thin sauce. Remove from heat and let sit. Sauce will thicken as it cools so be careful not to reduce too far. While liquid is reducing, sprinkle the topping evenly over the apples and place in oven on middle rack. Cook apples until topping has crisped and begins to brown, being careful not to burn the pecans. To serve: place a heaping spoonful of apples in a serving bowl and top with sauce. 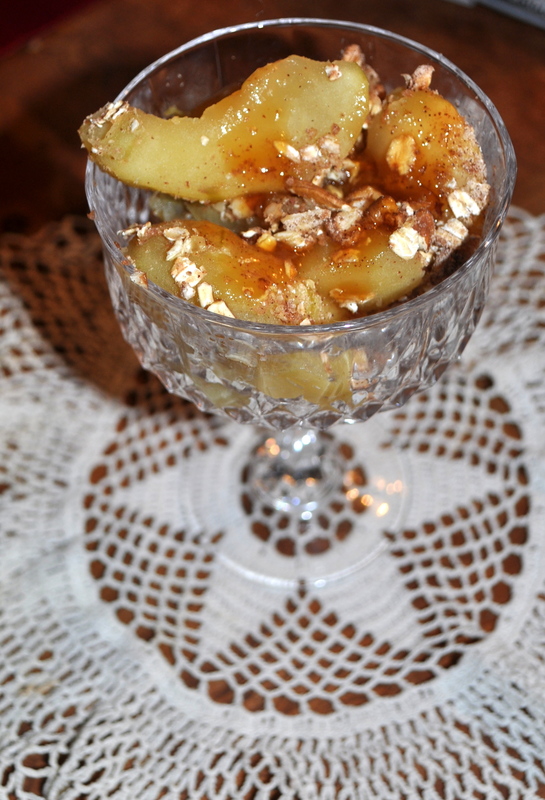 This entry was posted in Recipes and tagged apple, baked, cinnamon, desert, low sugar, no added sugar, recipe by monkeyneedle. Bookmark the permalink. Wow that looks fantastic! Might even make me venture into the kitchen and actually cook. What a lovely dessert! It looks like my favorite part of a pie put in a glass — the filling! I’d definitely ask for seconds too. Mmmmm… I agree. The filling is the best part! It’s why I tend to make more fruit crisps than pies… There’s a much larger fruit-to-topping ratio! It is wonderful to have someone to cook for me. He’s a keeper!